Joy, the latest addition to our full and loving life, continues to amaze us with her sweetness and unlimited amount of love and willingness to experience new things. This was certainly a concern for us as we split our time between two states and since she was adopted spent an entire 6 months in Western, Pennsylvania and then she was off on a long road trip adventure to the South. I wondered how she would react. Would she think we are moving from the first forever home she has known? 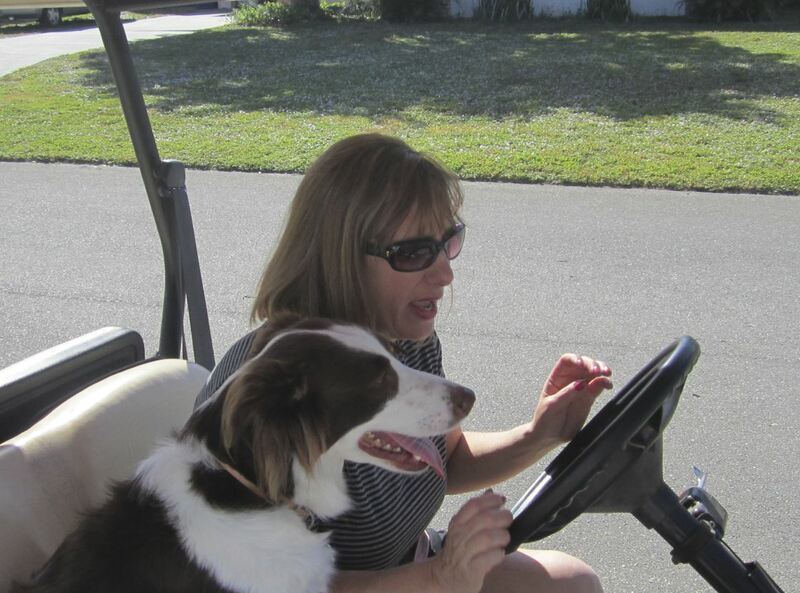 Would she miss it or would she adapt, as my friend Patty says dogs so when they are truly loved, like Joy. Safari, the cat love of our life, is used to the drill. He has been travelling with us for years and he is a sunshine guy without a doubt. Four day in and so is Joy. She loves it here and I knew one thing for sure. She would love Angel and Zoe, my neighbor Kevin’s and his sister Pat’s dogs. I love their dogs so much and I could not wait for Joy to meet them because I knew she would love them. Angel, a beautiful Golden play so sweetly together. One catches the ball and then gives it to the other, over and over and over. Adorable, if you love dogs like us. This is Kevin’s golf cart and he lets us use it. Her first ride on it was a few days ago. Today I borrowed it while Kevin was in school for a quick ride, later we all rode on it together before dinner – that will be the next picture. I do not think a day goes by when I don’t think about Joy’s early life in a horrible puppy mill. 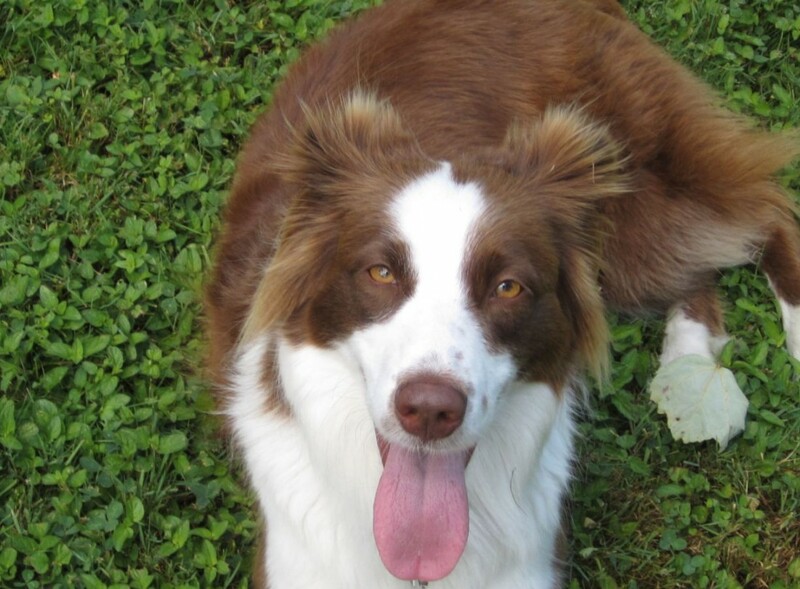 Thankfully when she was rescued by Indian Summers Border Collie Rescue, she was loved too, not just rescued. This is an amazing place filled with love, hope and care and as Dr. Summers says, a shelter is not a home; it is a temporary one, but not a real home – but I like to think it was really a great start for Joy. It was akin to a jailbreak, that puppy mill. Some do not survive, some are tortured mentally for the rest of their lives and some are tough like Joy and determined (Yes, that is THE WAY of a Border Collie) to find their way. Joy is very young, still a puppy herself. She had just turned 3 in May when we adopted her. She is first getting to experience the world. She now has travelled through 7 states! She went to her first doggy park yesterday and met two new boy friends that she loved, Willy and Sandy, a Westie and Sheltie, respectively. Her future days include many fun activities which I will continue to write about as they transpire. Joy, you are no longer leading a “sheltered life” you have a piece of the world pie and it’s our privilege to give it to you, with love and kisses, everyday. Categories: Adopting dogs, American Indians, Animal rescue organizationa, animals, Border Collies, cats, cats and dogs, Dog rescue, friends, Hope, joyfulness, rescue dogs | Tags: baileysjournal.com, border collies, dog rescue organizations, friendship, indiansummers.org, joy, kisses, love, princess dogs, puppy mills, rescue dogs, spirituality, unconditional love | Permalink.